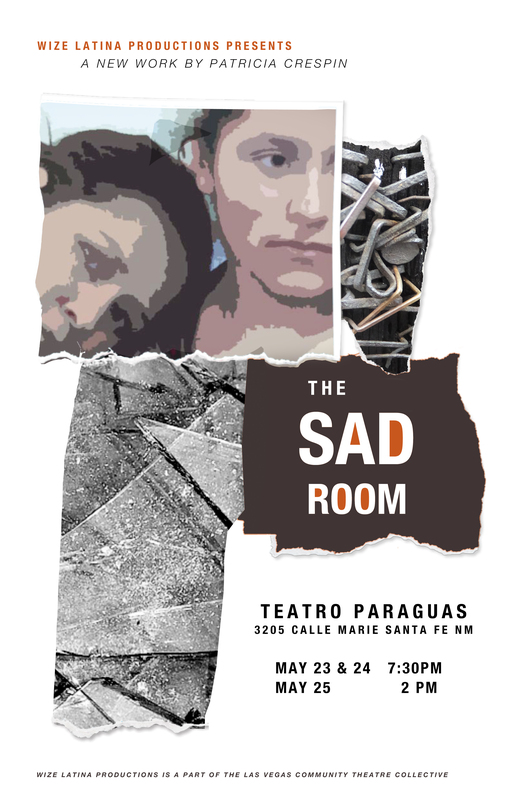 What: Wize Latina Productions presents The Sad Room a new Original play by Patricia Crespín. Synopsis: Set in the early 1990’s, The Sad Room is about Magdalena who has been keeping herself at home and alone since the death of her fifteen year old daughter, Santana, due to Heroin overdose five years before. Magda’s best friend, Maya, pursued by her abusive boyfriend, seeks safety at Magdalena’s apartment. Santana appears as a ghost. Maya tries to help Magdalena deal with the ghost of Santana but ultimately Magdalena has to come to terms with her daughter’s death on her own and let Santana go. Patricia Crespín: Playwright and Actress plays the part of Magdalena in her own original work The Sad Room. We are Hispanic, American Women…Okay? was first produced by New Mexico Highlands University in 2006 and directed by Patricia. It went on to receive productions by the Nat Gold Players in Las Vegas, New Mexico and Farmington, New Mexico, in 2006 and 2007, and by Teatro Paraguas in Santa Fe, New Mexico in the Spring of 2009. Confessions of a Hispanic American Women was produced by the Nat Gold Players in November of 2008. The Three Señorita Pigletitas was produced by Teatro Paraguas in September of 2009 and by KAHOOTZ Theatre Company in December of 2009. Both Living Purgatory and The Medea Complex made their debut at the University of New Mexico in the Words a Fire Festival. The Festival brought directors from all over the United States and Patricia had the opportunity to work with two top directors, Valli Rivera from Puerto Rico who directed The Medea Complex in the Spring of 2008 and Michael Goldfried from New York who directed Living Purgatory in the Spring of 2009. In the fall of 2009, The Medea Complex was produced in Los Angeles, California by the Breath of Fire Theatre Ensemble, and reappeared in Albuquerque at the National Hispanic Cultural Center and debuted in Santa Fe at Teatro Paraguas in May of 2012. Love’s Lonely Highway, was produced by the Southwest Rural Theatre Project in Albuquerque in June of 2013, and will debut in Santa Fe in the Summer of 2014. Her latest play, The Sad Room, will be produced by Wize Latina Productions, in conjunction with Clearly Confused Productions and the Las Vegas Community Theatre Collective. Wize Latina Productions is a newly formed company created by Patricia, whose mission is to produce theatre and film works that speak to and for the Latino community. Patricia’s film and television credits include: her first screenplay, BEFORE WE SAY GOODBYE, based on her stage play, We are Hispanic, American Women…Okay? was optioned and produced by Yellow Hat Productions in the Summer of 2009 and distributed by Universal Studios in 2012. Patricia co-wrote the screenplay, and was Co-Producer of the film. Patricia has written 2 teleplays; The Legend of La Llorona, and Land of Heirs. Both shows highlight the Latino culture from a Northern New Mexico perspective. Alex Angles: who plays Santana attends Robertson High School and is an actress with Clearly Confused Productions (CCP), Las Vegas’s Youth Theatre Group. Alex will be playing her first serious role in a full length production, playing Santana in The Sad Room. Alex joined CCP over a year ago and played a role in Get Over it: Second Chances an original play by CCP members. CCP won an award for outstanding achievement in original production with Get Over It at Aactfest 2013 in Los Alamos in March of 2013. Alex played a major role in Over The Edge VI put on by CCP and Nat Gold Players in August of 2013. This Spring Alex took third place in a monologue contest at the Theatre New Mexico Conference in Ruidoso. Tara Trudell in her first theatrical role plays the Curandera in The Sad Room. Tara Evonne Trudell, a mother of four, is working on her BFA in Media Arts with an emphasis in film and audio. It is through that art, combined with her passion for poetry that she is able to express fearlessness of spirit for her family, people, community, social awareness, and most importantly her love of earth. Activities in Las Vegas, NM: Founding Member of Nat Gold Players, president of the board until 2014. Adult founding member of Clearly Confused Productions, Founding member of The Las Vegas Community Theatre Collective. Among the various plays Riley directed, Confessions of A Hispanic American Woman, an original workby Crespín. Riley co-wrote Over The Edge I-VI and is working on OTE VII and directed OTE II-IV,V and VI. Riley is directing The Sad Room. Riley is interested in theatre that does more than simply entertain. Through Theatre humanity has a chance to observe and reflect. Theatre can be a means of epiphany and healing.